The Hulk is a first for many comic readers. When I was a kid there was a cartoon and a live action show. Everyone can connect with the “man inside the monster” story on some level, and being able to throw a car into space is pretty cool too. This morning as I was preparing to write this, I was thinking about the character of the Hulk in a way I hadn’t before. As I went over the cover images in my head, all of those issues that I really enjoy, I realized this. That, especially in the case of the “green berserker” Hulk, it was never about the main story for me. It was all about the guest star. Most of my favorite Hulk stories aren’t about the Hulk himself, but how he is seen through the eyes of whichever Marvel U. hero or villain is making an appearance in that particular issue. (This did change for me when they introduced the “smarter” grey Hulk.) The Hulk seen through a Captain America or Wolverine or Spider-Man glass is always more interesting that just a Hulk going on a rampage, though there is a place for that as well. So on that note, I present The Incredible Hulk #296. The cover image has one of the least utilized characters in the Marvel U., Rom the Spaceknight, squaring off against ole’ green and gargantuan. This takes place just after Secret Wars, in which the Hulk was injured. He has regained his mind so to speak by means of a “gamma cure” created by Bruce Banner. It’s the perfect storm of Banner’s mind in the Hulk’s body. A bunch of people got sick and a man named Max Hammer stole the cure and used it on them and himself, which only turned them green and made Hammer into a smaller version of the Hulk. The first 2/3 of the book involves Hammer-Hulk and Hulk smashing each other. Banner succumbs to the rage inside of him to gain the upper hand. Rom appears on the scene, following an energy signature that is coming from the gamma-radiated people, and cures them himself by neutralizing the gamma radiation in their cells. Then he’s off to find the Hulk. 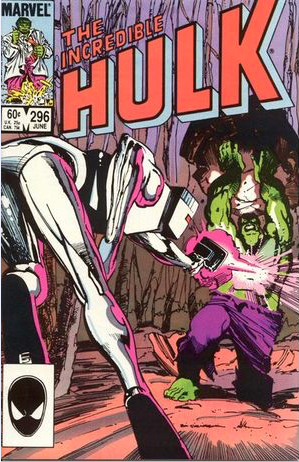 Rom cures Hammer but finds that the cell mutation in Hulk’s body is too old to be changed, and finally, we get what we bought the book for in the first place, that thing promised by the cover image. Rom and Hulk battle it out for a couple of pages until an errant fist hits Bruce’s current girl, Dr. Katherine Waynesboro. That act forces banner to the front of Hulk’s mind, and he flees. Originally created as a toy by Parker Brothers, Rom got a comic series from Marvel in 1979 written by Mantlo and drawn by Buscema. It only makes sense that they should bring him into the book they were working on at the time. How does this fit in with my earlier statement? Rom takes the familiar route of empathizing with the Hulk’s predicament. He knows that there is a man in there somewhere but cannot find him, and tries several times to cure him with his neutralizer. When the confrontation comes to blows Katherine tells him that Hulk was injured in the knee, and Rom understands her feelings for him. Hulk through the Rom-glass is a sympathetic character, as per usual in the Marvel U, he’s the misunderstood monster. Sal Buscema’s art is never to be denied. That is all on that subject. This entry was posted in brad gischia, Franco Romualdez, Incredible Hulk, lost in the longbox, marvel comics and tagged Bill Mantlo, brad gischia, comic book review, Incredible Hulk, lost in the longbox, Marvel, Rom, Sal Buscema. Bookmark the permalink.